The Technology 2030 Conference is designed to bring together tech business executives, chief information officers, community leaders, educators and policymakers to share best practices and discuss policy changes our tech firms and the state can make to leverage our tech strengths. See where Missouri stacks up against other states in key tech metrics. Learn how our top tech companies are recruiting and retaining talent. Find out how you can better protect your firm from cybercrime. Gain valuable insight on securing capital to grow your business. See what steps Missouri is taking to expand broadband and other needed policies. Discover how Missouri can brand itself as a tech hub. Cancellations must be made by March 6, 2019 to receive a refund. No-shows will be charged full registration fee. Substitutions are welcome at any time. 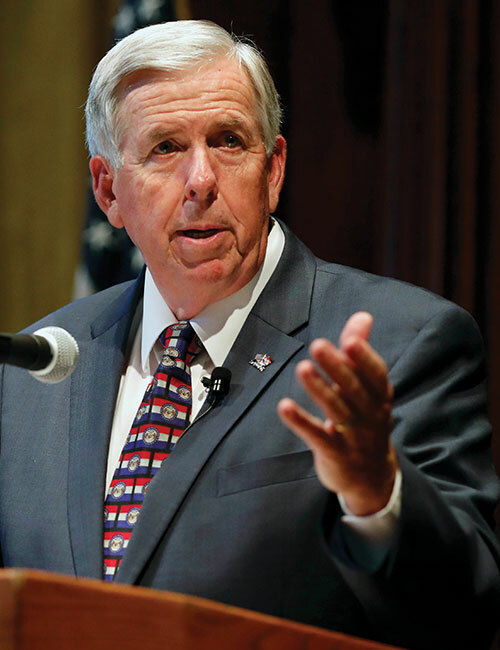 Governor Mike Parson’s administration is making bold moves to position Missouri for economic success. Listen to his goals to take advantage of Missouri’s technology assets and our position as a top 10 tech job growth state. As the author of the Missouri Chamber Foundation’s Technology 2030 Report, Abernathy will highlight the opportunities and challenges Missouri has in the tech space and share insights into how we can best leverage our technology strengths. Arbeiter will outline the goals, scope and timeline of the aggressive plan the state is deploying to make Missouri a broadband leader. As founder of ITIF, the world’s top think tank for science and technology policy, Atkinson is shaping the debate and setting the agenda on a host of critical issues at the intersection of technological innovation and public policy. Marr plays a critical role in helping WWT, one of Missouri’s largest technology companies, deliver on strategic growth and business goals by creating a high-trust culture that is a great place to work for every employee. DCI is the nation’s leader in marketing places, and Saunders has years of experience in branding and promoting technology-driven communities. She will discuss what it will take to make Missouri’s place in the tech space. Dr. Smith received the 2018 Nobel Prize in Chemistry. The Nobel committee called Smith’s development “major breakthrough technology.” His research provided the foundation on which human antibody pharmaceuticals were developed, including pharmaceuticals in clinical use to target cancer and inflammatory diseases. Please use this link to reserve a Renaissance St. Louis Airport Hotel room at the conference group rate. Sponsorship opportunities are available for this event. Questions regarding sponsorship opportunities? Contact Karen Buschmann for more details. For additional information or any questions please contact Katey Twehous or call 573.634.3511.